Home | Betterman Builders, Inc.
You take pride in your home, and we like that about you. We take pride in using our talents to make your home function in more convenient and sensible ways; bringing peace, harmony and beauty to your surroundings. We think that makes Central Indiana a better place for all of us to live. We are a woman-owned construction company in Central IN offering remodeling solutions to improve the flow and enjoyment of your home. Our years of experience in large condo association management have not only made us skilled maintenance and construction professionals; we are also expert project managers. Let go of the stress of managing multi-stage projects, and let us worry about that for you. We empower Indianapolis residents to be the kind of homeowners who would make their grandparents proud. From diagnosing leaks and making minor repairs to full tear-offs and roof replacements. Interior and exterior, scraping, removing wallpaper, weather-proofing, or just updating your interior color scheme. We can knock down walls and build them up again. Simple patches too. We are not only skilled maintenance and construction professionals; we are also expert project managers. Tell us what you have in mind, and we’re happy to work through ideas with you. Whether you need a hole patched in a plaster wall, or a new room added onto your home, Betterman Builders is capable and eager to get started. Every job is unique. We will treat your project with the same care and attention to detail we would expect in our own home. 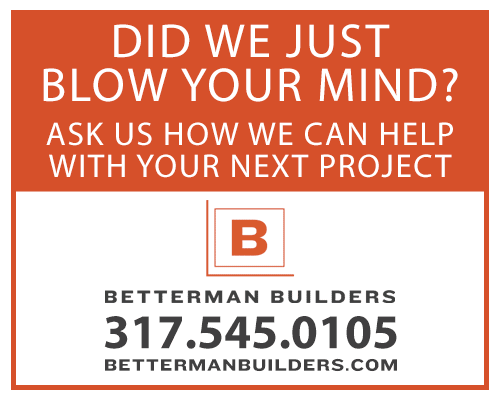 From Carmel to Greenwood, Speedway to Greenfield, and everywhere in between, Betterman Builders is proud to be part of the Greater Indianapolis area. Give us a call today. We’ll be in your neighborhood. I have nothing but good things to say about the entire experience from the quality of work completed to the friendly conversation of the folks who did the repair. I found this company to be friendly, hardworking, and unusually knowledgeable about the quirks of old houses, which worked VERY well for my purposes. Perhaps most importantly, their work is quality. I recently hired Betterman Builders to complete a project in a short amount of time due to another contractor’s error. Not only did they provide a reasonable quote, the work was done professionally and quickly. I would hire Betterman Builders for any project I have, and recommend them to all my friends and family! Tell us about your project and we’ll get back to you.